Air Tahiti is the domestic carrier of French Polynesia (though it will begin to fly to the Cook Islands in April). It is a different airline from the international carrier Air Tahiti Nui. 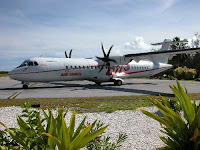 It's a fine airline and you will be flying on 48 or 66 seat twin turboprop aircraft (smaller aircraft is used for the remote islands). Pineapple juice will be served. Meals are only provided for flights to the Marquesas, Gambiers and Hao. Sandwiches are offered for sale to the Australs. You'll get a very nice Air Tahiti magazine. The seating is open, first come, first served. The luggage allowance is less than on your international flight to Tahiti. You are allowed 10 kg (22 lbs) if you purchase your ticket in French Polynesia, 20 kg (44 lbs) if you purchase it overseas. If you are a diver and have your international dive certification card (and international air ticket) you are allowed an extra 5kg (11 lbs). Hand luggage is restricted to a day pack size (17” x 13” x 7”) weighing less than 3k (6.6 lbs). They made me check in my "fits under the seat" rolling pilot bag. If you are over the weight limit you have to pay for the excess. The cost per kilogram depends on your flight. If you want to calculate the cost go to the fares page and enter your to and from destination and you will see the excess luggage cost for that leg. If you pay for your return flight overage at the same time you receive a 30% discount. You can also get a "Circle trip including several islands" rate. Instead of paying excess luggage for each leg, you would just pay the roundtrip excess rate for the island that is the furthest from Tahiti (or Moorea). For example traveling Tahiti/Moorea/Huahine/Bora Bora/Rangiroa/Tahiti. The normal additional segment rate is 740 per kg; the discounted rate is calculated Tahiti/ Rangiroa/Tahiti, or 400 per kg. All that being said, 50 lbs. is a lot of luggage and should be more than adequate for your needs.